The PCRmax Eco 48 real time PCR system is a high specification, economically priced real time thermal cycler that accommodates a unique 48-well polypropylene PCR plate utilising the same geometry as standard 384-well plates, but only 1/8 of the size. This enables users to dramatically reduce the qPCR reagent volumes compared to traditional 96-well instruments, whilst still producing a strong fluorescence signal. Minimizing the plate size also significantly improves thermal uniformity. A minimum volume of 5µl is validated, cutting reagent costs in half and making more efficient use of expensive and hard to acquire template DNA samples. 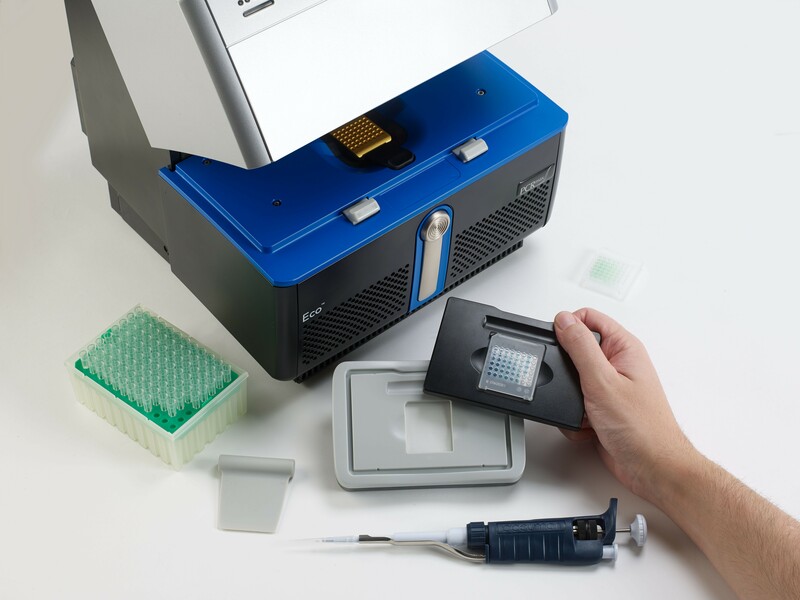 Load samples into the 48-well plate using the backlit Eco Dock and place the plate into the Eco 48.
qPCR specificity and efficiency relies on precise temperature control during the denaturation and annealing steps. For the highest accuracy, temperature must remain uniform across the entire heat block, ensuring that all samples are processed equally. The patented hollow silver and gold liquid filled thermal block design of Eco 48 achieves this with a unique heating and cooling system that provides accurate ±0.1ºC (measured at 95 ºC) temperature control and quickly cycles from one temperature to the next not requiring any settle time at all to hit your specified temperatures. 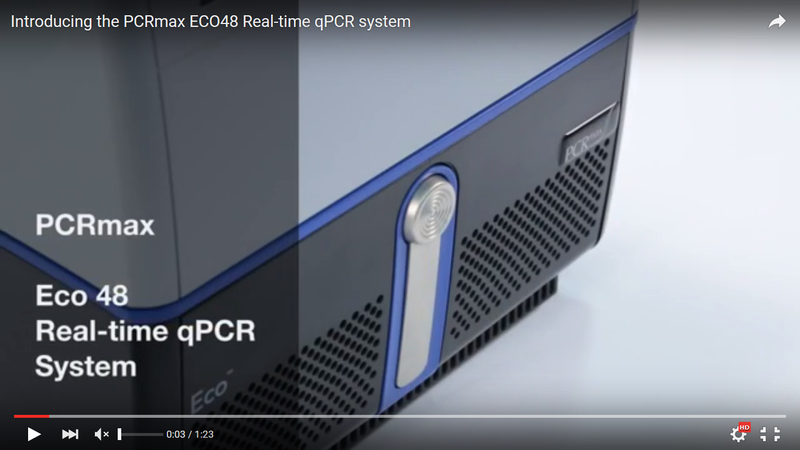 The Eco 48 Real Time PCR system contains an advanced high-performance optical system that delivers precise and sensitive fluorescence detection, facilitating all 4 colour multiplex applications. The system is provided factory-calibrated for use with SYBR®, FAM™, HEX®, VIC®, ROX®, Cy®5 and can also be used with any qPCR fluorophores overlapping with these calibrated dyes. 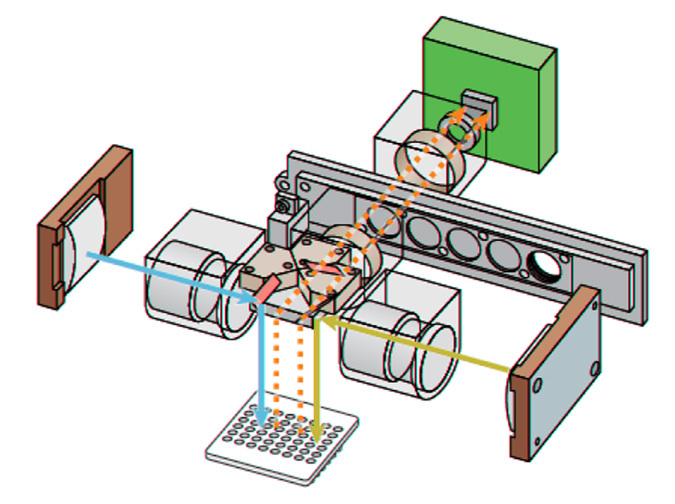 For excitation, two panels of 48 fixed LEDs provide excitation energy of distinct spectra, enabling broad range excitation. Each of the 48 LEDs illuminates a specific plate well location, eliminating the optical distortion created by most stationary optical systems. HRM analysis protocols are supported by continuous data acquisition during the melt for increased data collection and reduced run times. The user can change the plate setup and perform data analysis after the run is complete. The Eco 48 optical unit also utilises a proprietary and patented technology called Adaptive LED Control (ALC) which ensures that your signal never suffers from cross talk or light pollution from the neighbouring well giving you false data, an enormous >9logs dynamic range and also ensures the CCD detector system never saturates to give the Eco 48 the sensitivity and precision to detect down to 1 copy at the same time as detecting .101o copies of a target. Eco 48 has rapid heating and cooling rates. Average ramp rates of 5.5°C/sec to aid in reduction of overall PCR run times. The typical run time for a 40 cycle PCR protocol is around 40 minutes. In testing, the quickest optimised programme enabled a 40 cycle qPCR experiment to complete in just under 20 minutes without sacrificing thermal uniformity in the process as the block still achieves a thermal uniformity of ±0.1ºC (measured at 95 ºC) at these speeds. Eco 48 thermal control is superior to traditional 96-well peltier systems where thermal efficiency decreases as distance from the peltier increases. With Eco 48, faster and more precise cycling increases sample throughput because the need for multiple replicates is reduced by increased uniformity across the block. Eco 48’s well-to-well, plate-to-plate and instrument-to-instrument results are as consistent as running a single experiment. To take advantage of this, Eco 48 has a function in the software where different experiments are reliably combined and analysed as one. High uniformity reduces the need for experimental replicates which saves on precious samples, eliminates the need for more expensive instruments, reduces reagent running costs and ensures you can do more with the sample you have. The Eco 48 system come with two distinct software’s, the first, Eco Control, drives the units set up and experimental runs while Eco Study is the analysis package. The Eco 48 softwares are both open licence, you can install them on as many PCs as you like, and MIQE compliant. Eco 48 software uses a unique icon-driven user interface to simplify experimental design and setup. Pre-set thermal profile defaults are provided for the most commonly used experimental protocols. Temperature and time for each protocol step can easily be changed by click-and-drag action. 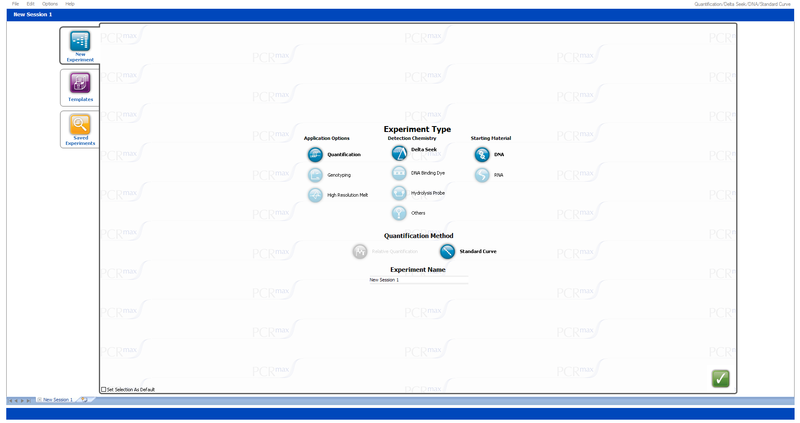 Experiment templates can be customized and saved for future use. With the Eco 48 system and software, data collection is monitored in real time, allowing researchers to access run viability immediately. 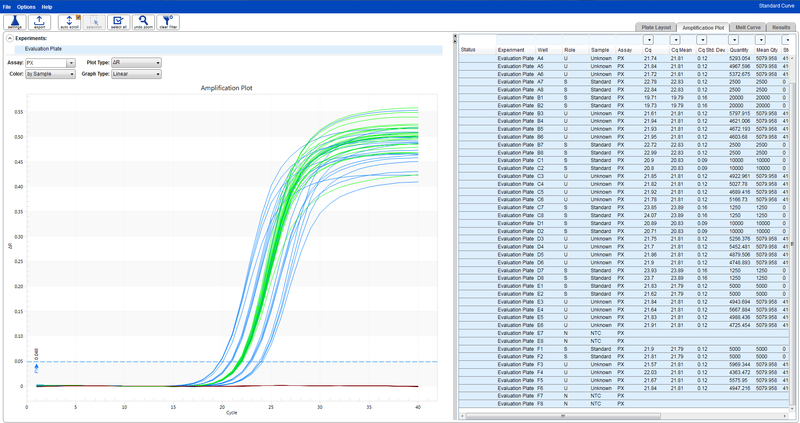 The user-friendly data analysis interface also allows researchers to easily view the amplification plot, melt curve analysis, and the analysed results, including Cq values, PCR efficiency, R2 and Y-intercept. Data can be exported into Excel or CSV and custom reports generated directly into PowerPoint or PDF formats. High-resolution images can be directly exported in multiple image formats, ready to use in any presentation. Conforms to Minimum Information for Publication of Quantitative Real-Time PCR Experiments (MIQE) guidelines, making data analysis and submission for publication review more efficient. User-installable, intuitive, easy to use software that integrates user control, real-time data collection, and advanced data analysis. Supplied fully featured including HRM capability. New software enables a widened chemistry library and contains new thermal profiles. Data analysis and Multi-Experiment Analysis. 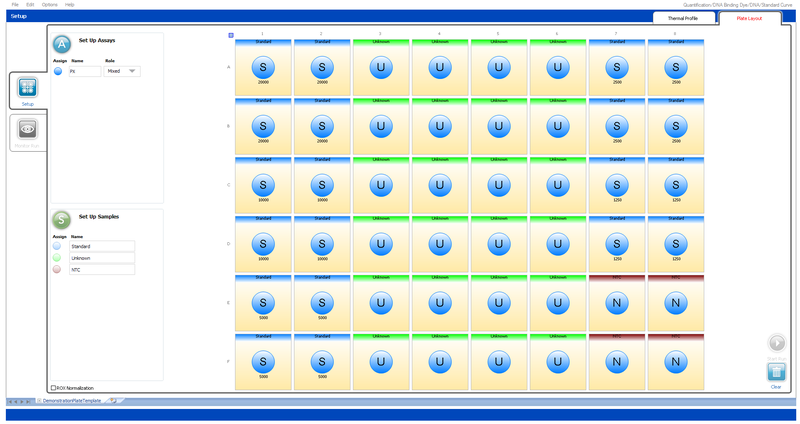 Allows higher throughput, pool separate plates together and analyse as one experiment.